Can’t get enough coverage of the upcoming Samsung Galaxy Note 4? You’re in luck! A video was posted on Samsung’s Chinese media page showing off the new flagship big phone, a.k.a. phablet. 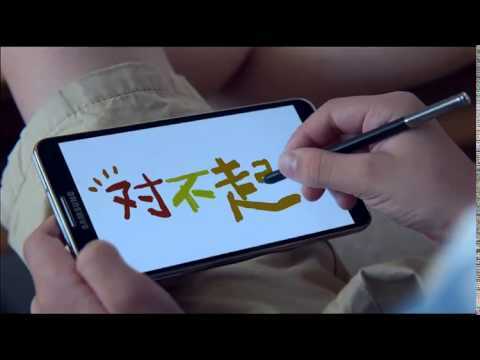 In this touching video, it shows how the Galaxy Note can bring families together. When the phone starts shipping in a month o two, the Samsung Galaxy will show you how to separate a couple hundred dollars from my wallet! I’m been using a Galaxy Note Phone since the Note 1 was released a few years ago. I distinctly remember all of the weird looks I got when I held that huge phone to my head! I also remember all of the fellow tech geeks inquiring about the phone and lauding my purchase. When the Note 4 is released, I will be first in line to get one. I suspect that some of the people that laughed at my Note 1 will be in line with me to get the Note 4. We expect the Samsung Galaxy Note 4 specs to include the following: a 5.7 inch QHD display, a 2.7GHz Qualcomm Snapdragon 805 Processor, 3GM of ram, 32GB of storage, 2560 x 1440 resolution, a rear facing 16 megapixel camera with optical image stabilization (OIS), and a 4MP front facing camera. Please note that these specs are not official. The Note 4 is expected to be announced on September 3rd, 2014. It’s expected to be released shortly after. I will update the actually release date as soon as it’s officially announced.